Witness the sparks of artistic creation at their exact moment of ignition. Movement artists, musicians and lighting designers will teeter between instinct, play and loss of control as they improvise a night of performances that challenges the artists to create work in the moment. The Flashes of Brilliance that ensue will be unique, unrehearsed and will exist for this one night only. 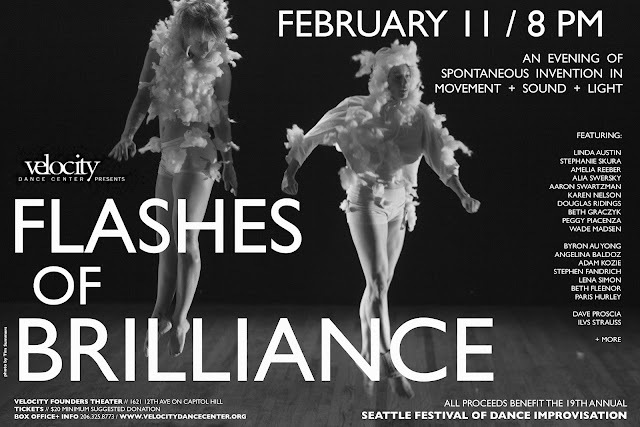 This night of spontaneous invention in movement, music and lighting will benefit Velocity Dance Center’s newly acquired program: the Seattle Festival of Dance Improvisation (SFDI).